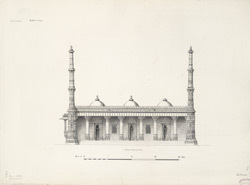 Illustration of the front elevation and plan of Rani Sipri's mosque and tomb at Ahmadabad, in Gujarat from James Burgess' 'Original Drawings [of] Muhammadan Architecture of Ahmadabad.' The Rani Sipri mosque, built in 1514, is located in the south-eastern part of Ahmadabad near the Astodiya gate and was built for Rani Pirai, who was the mother of Sultan Mahmud Begada's son (r.1459-1511) Abu Bakr Khan. This elegant mosque is also known as Masjid-i-Nagira or Jewel of a Mosque. James Burgess quotes Mr Fergusson in the Archaeological Survey of India, Vol VII: "Notwithstanding the smallness of its dimensions...it may be considered the gem of Ahmadabad, and in its class, as one of the most exquisite buildings in the world." The tomb of Rani Sipri lies to the north-east of the mosque. It comprises a square of twenty columns enclosing another of twelve. A perforated screen, resting on a low wall between the outer pillars, encloses the entire tomb. Around the corners of the building is a carved stone rail, up to the height of the pillar bases, with a cornice that curves outwards.